I usually smoke my reliable and tasty nine bit Factory Throwout #49 Sungrown most every day. Maybe every third day, I'll try something new from the pile of fine uppowoc which BOTLs have sent me, or pick up some interesting flammable cylinder at the fine B&M nearby. But lately, I've been missing my nine bit dailies. Last bundle of 49s I scored turned out to be something else entirely, made out of unshredded cigarette tobacco, near as I could tell. Packer's error, I'd say. So I stuck them in a bomb I'm sending out to my stepson, who is a lifelong cigarette smoker, cause I think he would like them. This leaves me smoking the upper crust uppowoc daily. Last night, I stumbled upon an uppercrust uppowoc which is in truth a daily: the Punch Uppercut. 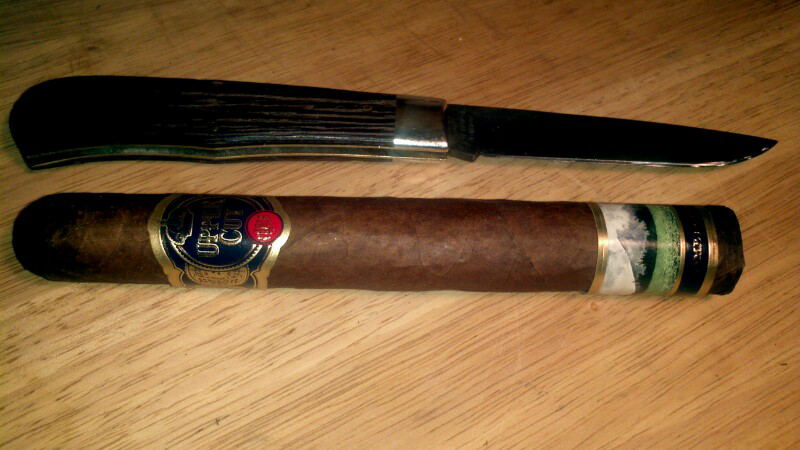 It masquerades as a select cigar, with a seven buck price tag, a pair of fancy bands, a fine looking wrapper, and an ample 6 1/2" x 54 gauge size. But in reality, it smokes about as well and as long and almost as flavorful as my nine bit six inch 46 gauge reliable 49. With this one exception: I prefer the sungrown. This stick is big and voluptuous and dark. It reminds me that way of Roshell, a voluptuous black girl I lived with briefly in my yoot. Jesus, what a killer body. Stacked. Quirky girl. No, even more quirky than most. **** as... But I digress. Let's see if a new paragraph would help. I admired that lower band with the picture of Ometepe mountain. Uppercut had a mild odor, and tasted just about flavorless. Uncapped real messy. Messier even than the nine bit machine rolled throwouts. All jaggeddyass shreds and crap. Picking stuff from my teeth all thru this smoke. Tight draw. No flavor unlit. I toasted the foot with one match. That didn't completely light it, but I let it burn itself the rest of the way across. Punch yielded remarkably little volume for such a fat stick. Throughout the experience, I had to hit two fairly smokeless puffs each time, then draw hard to get a big mouthful. Tasted like dry sweet wood. Dry wood retro. Mild throught. Consistent. Each time, the ash would mushroom and had to be knocked off at 3/4". I got an hour and a half out of it. My conclusion was, it would be a decent daily, if you like mild dry sweet wood. But way over priced for what it is. I got no stinkfinger. Had a hearty morning mouth today. No wheeze. Three stars. At the very outside. Might have been a bum stick. I had a better experience with it. I really liked the couple I've tried. Maybe a bum stick. 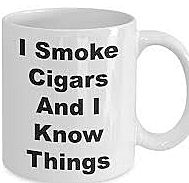 This is my problem with a lot of cigars. I don't keep hundreds of cigars on hand (wish I could), so its hard for me to age cigars. The few that I have aged have greatly benefited from it, but I would like it if all cigars were good ROTT. Another problem I have with aging is that when the cigars are aged and I love them, I am out and have to buy more and let them age a year. Seriously annoying. Oh well, such is life. I guess I either need more patience, cigars, or better planning. Had a couple of these lying around from a sampler I got a couple years ago. Smoked one last night, Pretty good. Never smoked one rott so not sure if it was the age or not. Way to necro. Want another review? Smoked a lot of Punch when I started out. I don't remember them being so "pugilistic" as the few I have smoked recently. I don't know what changed whether its me or the cigar but I definitely notice a difference. Punch Uppercut is actually one of my all-time favorites, even though I've only had a couple. I dig the Ometepe though.